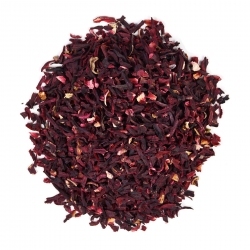 Individually wrapped Steuarts Tea - Pure Hibiscus is made from the infusion of deep magenta-coloured calyces of the flower roselle (Hibiscus sabdariffa). Very popular for health benefits such as lowering high blood presure. 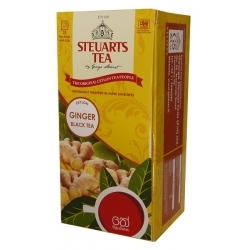 A blend of High Grown Ceylon Tea with Ginger creating the premium herbal fusion with a long list of health perks. A fusion of Ceylon Green Tea with natural ingredients, making this beverage filled with natural goodness with a long list of health benefits. A blend of High Grown Ceylon Green Tea with Ginger and Lemongrass creating the premium herbal fusion with a long list of health perks. 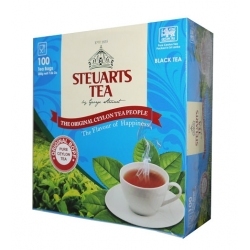 This pure Ceylon Green Tea from the high grown regions of Sri Lanka, this tea contains no added flavours thus preserving it's delicate original smooth taste. 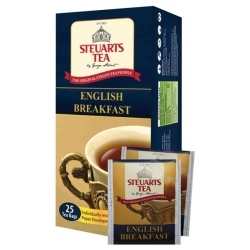 The English Breakfast - Steuarts Tea is enigmatic for the mornings. It contains higher levels of caffeine than its counterparts and is dripping in antioxidants and health perks. 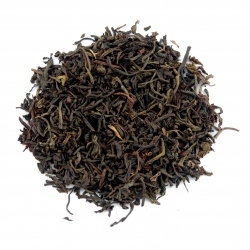 So try our English Breakfast Tea to find out why it is enduringly loved. 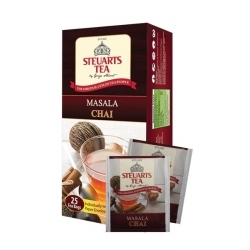 A blend of Ceylon Tea with Cinnamon, Cardamom, Nut meg Clove and Pepper. 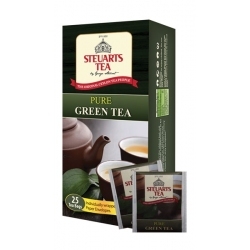 Pure Ceylon Green Tea A reflection of Steuarts Ceylon’s mastery of the fine art of tea blending, this premium Green Tea is created from the first flush of tea shoots hand plucked from the dew laden mountain orchards of Ceylon. It is a healthy source of antioxidants that combat free radicals and promote overall well being. Light, distinctive and aromatic. 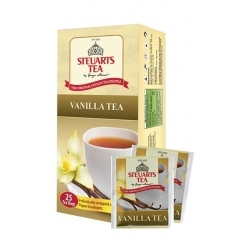 A unique blend of the finest teas from the highlands of Sri Lanka, mixed with vanilla flavour. 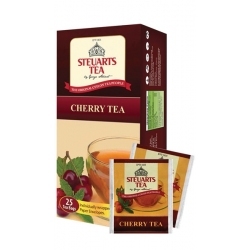 A unique blend of the finest teas from the highlands of Sri Lanka, mixed with cherry flavour. Chamomile - 100% Herbal Tea A reflection of Steuarts Ceylon’s mastery of the fine art of blending teas and herbal beverages, this is made up 100% of Camomile known for its natural calming properties. 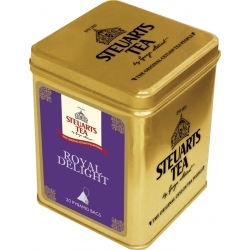 The relaxing and soothing tea is the ideal night cap after a hard day’s work. Unwind, relax and enjoy. 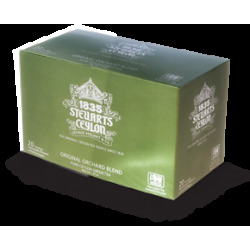 A unique blend of the finest teas from the highlands of Sri Lanka, mixed with lemon flavour. 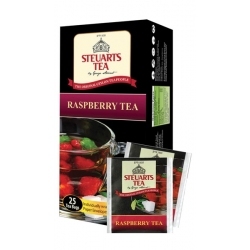 A unique blend of the finest teas from the highlands of Sri Lanka, mixed with raspberry flavour. 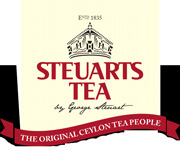 A unique blend of the finest BOPF tea from the highlands of Sri Lanka. 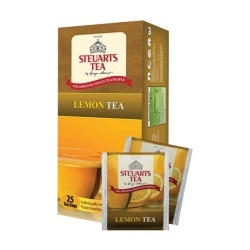 Lemon Black Tea A reflection of Steuarts Ceylon’s mastery of the fine art of tea blending, this Lemon Black Tea acts as a purifying agent and rejuvenates you by improving your metabolism and uplifting your mood! 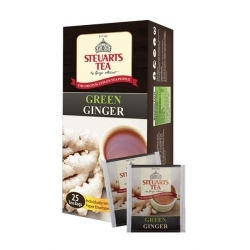 The refreshing burst of zesty lemon flavour makes this the ultimate cuppa for vitality and spirit. 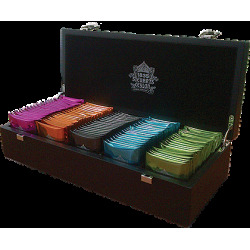 This is a 5 Compartment wooden tea chest filled with premium ceylon tea. 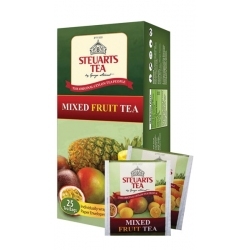 It includes English Breakfast, Vintage Earl Grey and Original Orchard, Zesty Lemon & Calming Camomile Tea bags individually wrapped in Alu Foiled packs for maximum freshness. 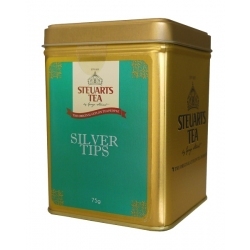 The Box contains 20 Alu Foil packs per flavor with a total of 100 tea bags for the tea chest. This is a 3 Compartment wooden box filled with premium Ceylon tea. 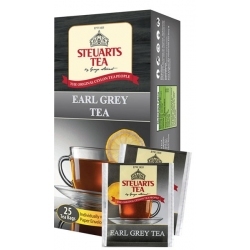 It includes English Breakfast, Vintage Earl Grey and Original Orchard Tea bags individually wrapped in Alu Foiled packs for maximum freshness.